“A bowl of blessedness,” that is what Will Rogers called chili, and the motto of the Chili Appreciation Society International insists that “The aroma of good chili should generate rapture akin to a lover’s kiss.” Chili is good any time, but when winter’s chilly winds blow, a bowl of red is of special comfort. Chili’s beginnings are as dark and mysterious as a bowl of red itself. Chili’s invention, if in fact chili was invented and not just handed down from some benevolent deity, has been ascribed to a Spanish nun, immigrants from the Canary Islands, trail cooks on their way to the California gold fields, and the lavanderas, the washerwomen who followed the various armies that marched across Texas in times past. If chili’s birth is forever lost in a historic haze, historians agree that chili con carne—chili with meat—came into its own in San Antonio in the 1880s. It was the fare of the “Chili Queens,”— the women who sold stew made from dried chilies and beef from stands set up in the Military Plaza in the Alamo City. By the time they moved their operations to Market Square in 1887, the Chili Queens were a fixture, and all classes of people would line up to get a plate of chili and beans and tortillas. Open mesquite fires crackled in the twilight, and paper lanterns lighted up the wagons and carts around the stalls. In time the places became semi permanent and added tables and stools for their patrons. The Chili Queens were part of San Antonio until the city’s health department shut them down in 1937. All that is left today is an annual “Return of the Chili Queens Festival,” held in the square each Memorial Day. Until the 1890s, chili cooks had to make up their own mixture of spices by picking, roasting, drying, and pulverizing the various varieties of chilies that gave the dish its bite and its character. Fort Worth claims that DeWitt Clinton Pendery made the first batches of commercial chili powder to sell under the name “Mexican Chili Supply Company.” San Antonio claims the honors, too, holding that William Gebhardt of New Braunfels sold the first makings in their town under the name “Tampico Dust.” Both chili powders are still sold today, albeit under different names. In the early days, chili was a do-it-yourself project. Even with the introduction of chili powder, ready-made chili for home consumption was hard to come by. The first commercial offering was brick chili, dried meat, spices and fat ground into a paste and formed into bricks. The cook broke up the bricks and reconstituted the chili with water. 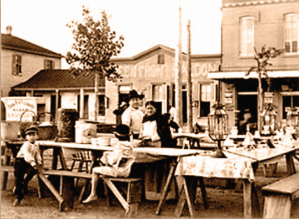 That’s how Lyman T. Davis started selling his “Lyman’s Famous Homemade Chili” at his Corsicana meat market in 1895. It was the same product he had peddled out of a wagon for five cents a bowl with all the crackers you could eat. In 1921, Davis put his chili in a can and decided to put a picture of Kaiser Bill, his pet wolf, on the label and Wolf Brand Chili hit the market. Davis struck it rich in 1924—no, not with chili, with oil—and sold the chili business to J.C. West and Fred Slauson. They promoted the product by customizing the cabs of Model T Ford trucks to look like Wolf Brand Chili cans and sent their salesmen out across the Lone Star state with a live wolf in a cage on the back. 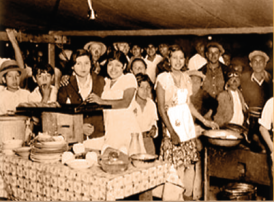 By the 1920s, chili was a staple of Texas eateries. Rare indeed was the town without at least one chili parlor. To call them restaurants or even cafés would be a stretch. More often than not, they were shacks or holes in the wall with a counter, a few stools and a kettle of chili gurgling on a burner in the back. During the hard times of the Great Depression, cheap chili and plenty of crackers filled many a growling stomach. Eventually chili found adherents outside the Southwest. Along the banks of the Ohio, a Greek immigrant started selling a strange mixture of ground meat and Middle Eastern spices poured over spaghetti and topped with cheese, onions, kidney beans and oyster crackers. The folks in the Queen City ate it up, and Cincinnati chili was born. Why is a question that has baffled true chiliheads ever since. The thin gruel containing cinnamon, chocolate or cocoa powder, allspice and Worcestershire sauce, among other things, is certainly something, but chili it’s not. Although chili cooks doubtless had been having informal competitions for years—the State Fair of Texas had a chili contest in 1952—the competitive chili battles really kicked off in 1967 when Homer “Wick” Fowler, a Dallas news paper man, and humorist H. Allen Smith of New York City faced off over the chili pot in the trans Pecos ghost town of Terlingua. 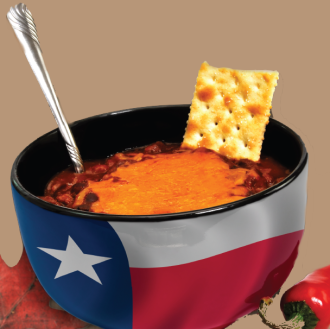 Smith had written an article in Holiday Magazine entitled “Nobody Knows More About Chili Than I Do,” and had thrown down the gauntlet by declaring that nobody in Texas could make a better bowl of chili than he could. He included a recipe which (heresy of heresies) contained beans. The contest ended in a tie, when the judge, Dallas lawyer Dave Witts, declared his taste buds too singed to discriminate and called for a rematch the next year. Today chili contests sanctioned by the International Chili Society brew up all over the country, leading to a World’s Championship Chili Cookoff. Restaurant chili is hard to find, and good restaurant chili nigh near impossible, so when the unmistakable craving starts to take hold, you had best just brew up a pot of red yourself. Chili kits, packages with all the spices you need, are available in stores everywhere. Brands carrying the name of Wick Fowler and racecar driver Carol Shelby are well known. The Hell on the Red outfit in Telephone, Texas, makes an excellent liquid mix called Hell on the Red Chili Fixins. Add a jar of fixin’s and a jar of water to two pounds of browned chili meat and simmer for an hour, or so and you should be most pleased with the results. The product is a bit hard to find, even in local stores, but the grocery stores in Bonham usually have some. You can also order direct from Hell on the Red by giving them a call at (903) 664-2573. A few years ago, someone sent me a clipping from the Leonard Graphic, published in 1948. It was an article about a chili supper thrown by the Leonard Volunteer Firemen to honor a retiring volunteer fireman, my grandfather, Les LaRoe. Even though he was the honoree, they had him make the chili. Here is his recipe. Float the sliced chilies on top of the mix. Reduce the heat to low and let the mix simmer for a couple of hours or until the meat is tender. So important is the No Bean rule that Ken Finlay, owner of the Cheatham Street Warehouse, a music hall in San Marcos, wrote a song about it in 1976. That song is now the official anthem of the International Chili Society. 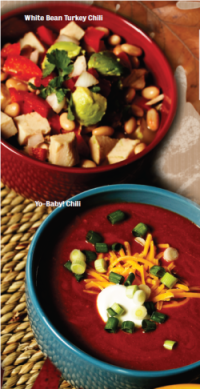 Here are some chili basics. Use lean beef, chuck or round; more expensive cuts aren’t necessary. Trim into small pieces. The size of the last joint of your little finger is a good guide. Purists prepare their own chilies, but a good brand of chili powder fills the bill. If you use tomatoes, the diced versions save time and trouble. If you want to cut down on the salt in your chili, use fresh tomatoes. Roma tomatoes are good choice. Peel, seed and chop, or just go rough. No beans. If you’re frantic for frijoles, serve them on the side. Add a bottle of beer, if you like. Chili is better if refrigerated and aged over night. Remove the solid fat, reheat, and thicken with masa harina mixed into a paste with the juice from the chili. 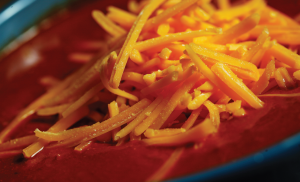 Traditional add-ons are shredded cheese, chopped onion, and saltine crackers. Cornbread is good too, as are Fritos. Anything else is your call. The godfather of Texas chiliheads was the newspaperman and Texas folklorist, Frank X. Tolbert, who distilled the essence of the Lone Star classic in 1966 in the 110 pages of a little book called A Bowl of Red. Tolbert’s take on “back to the beginning” chili follows. He admitted that the old-time cooks used beef suet (pure white fat from around the animal’s kidneys) as the fat source, but he didn’t like fat and so bowed to the more modern palette, by using vegetable or shortening. If using chilies, trim the stems, remove seeds, and discard both. Place chilies in a small saucepan and add water to barely cover. Bring to a boil, remove from the heat, cover, and let stand for fifteen minutes. Transfer the chilies and their soaking water to a blender or a food processor fitted with a metal blade. Purée until smooth. Set aside. Heat oil in large skillet and brown half the meat over high heat for six to eight minutes. Transfer the meat and juices to a heavy pot, and add the puréed chilies or chili powder, if using. Place over low heat and bring to a simmer. Meanwhile, brown the remaining beef in the same manner, and then transfer it and the juices to the pot. Add enough stock or water to just cover the meat. Bring to a boil, reduce the heat to low, and simmer, uncovered, for thirty minutes. Add the garlic, onion, cumin, oregano, salt to taste, paprika and cilantro to the meat, and continue to simmer, uncovered, stirring occasionally, until the meat is very tender, another 30 minutes. Add a little liquid if the mixture begins to stick or looks too dry. When the chili is ready, use a large kitchen spoon to skim any fat from the surface. Ladle into bowls and serve. Makes four to six servings. Note: There’s an easy way to remove excess fat from this or any dish, but you have to make it ahead of time. Let the chili cool, and then refrigerate it for several hours or overnight. The excess fat will harden on the surface and be easy to remove. Then, reheat to serving temperature. Men, children and women gather around the Chili Queens in Haymarket. Cube the beef into bite-sized chunks. Dice the bacon. Heat a large heavy pot and fry the bacon until almost crisp. Scoop it out and set it aside (so it won’t burn). Then fry the beef in the bacon fat until browned on all sides—you may have to do this in batches. Scoop out the meat and add to the bacon. Sauté the onions (and garlic if you’re using it) in the bacon fat. (Those who really get concerned about fat can drain some off, but it won’t be true Texan at that point.) When the onion and garlic are soft, throw in the cumin, chili powder, and paprika, and cook briefly. Return the meat to the pot, cover with water, and bring it to a boil.Taste and add salt; then cover and set it to simmer for a couple of hours. Thicken as needed with cornmeal or stale tortillas. Serve with sour cream or cottage cheese, diced onions and, of course, beer. Like all good chili, this is best made a day in advance and reheated.